When MOMA New York reopened its doors in 2004 I walked through the galleries delighted with the space, and disheartened to see only a handful of female artists represented. I think on all floors I saw an Eve Hesse sculpture, Cindy Sherman photograph, maybe a Louise Nevelson piece, and the others I either missed (surely I didn’t see everything that day). I could safely say there was a drought in representation of the female artists. I think the actual total was out of the 400 works on display 14 were female. MOMA covered some lost ground by exhibiting female photographers works in the Summer of 2007. Historically though the narrative of the museum’s collection is male centered. Following that there have been some blockbuster exhibits about female artists. In 2007 Wack! Art and the Feminist Revolution (LA MOCA, p.s. 1, and Vancouver Art Gallery) brought up some very important points on the social and political front that made huge impacts on female artists during the 1970’s. The struggle to have their work shown during their time seems palpable in retrospect. It seems to be tides are turning in representation, and especially with historic representation. At the Seattle Art Museum this month there is an opening of the exhibit “Elles: Women Artists from the Centre Pompidou”. The artists span a century, and the works are split up in four parts Abstraction, Feminism and Critics of Power, The Body, and Narrations. They are also re-installing their modern and contemporary galleries with only women artists. These women have problematized and played with gender identifications and characterization, from lady to woman to other in some form, consciously or unconsciously. While I am excited to hear the spotlight shining graciously on female artists, who truly have not had great exposure historically, I just don’t know what problematized means. Keeping it simple I believe as humans we live on a continuum – some days we act more male than female, some days males may act more female then male. So framing art and art practice as gender specific seems a little off. I wonder if in 100 years the pendulum will shift again and we will have boys only art shows. This sounds pretty lame, so maybe just having equal representation with any art exhibit of a certain theme or era would suffice. 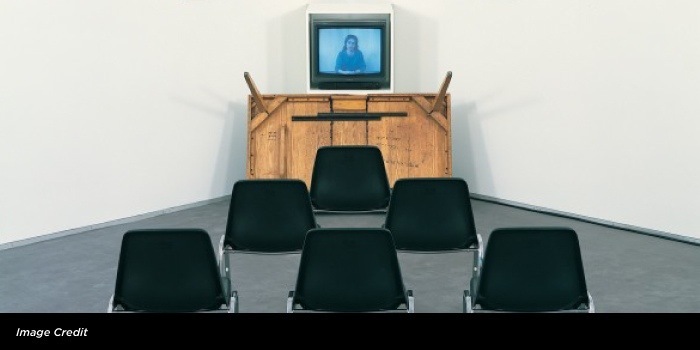 Image courtesy of SAM web site, image is of artist Adrian Piper’s work.